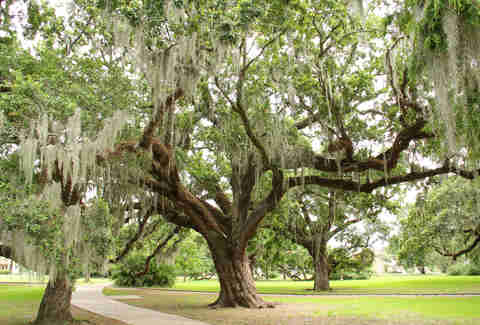 New Orleans’ largest green space is filled with iconic oak trees, alligators, feathered friends, and so much to do that you could spend an entire month there without traversing the entire thing. Hop on the red streetcar 'til the end of the line and enjoy all that City Park has to offer, from seasonal treats like Celebration in the Oaks to the secluded lookout spot at New Orleans’ highest point. I'm on a New Orleans Dance Team. Here's What It's Like During the Mardi Gras Parade Season. Is there any type of garden that City Park doesn’t have? 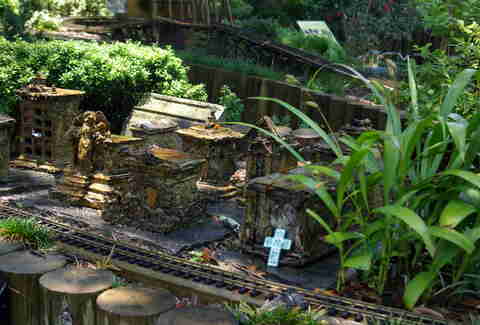 In the corner of the botanical area sits the New Orleans Train Garden: 1,300 feet of track filled with tiny versions of streetcars, passenger trains, and freighters. Trains only run on Saturdays and Sundays but the spectacle is not be missed. At every stop is a point of interest detailing the quaint parts of New Orleans. Turns out shotgun homes look just as cute even at 1/22 scale. 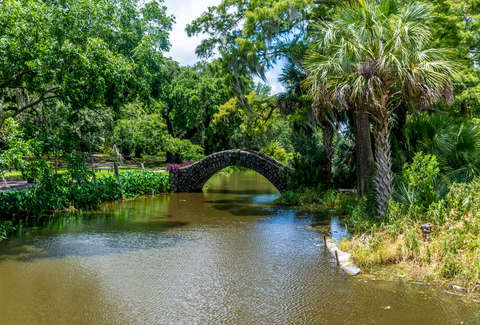 City Park’s lush botanical garden is one of New Orleans’ best wedding and events venues, playing host to concerts, charity dinners, and plant sales so you can test your own green thumb skills after getting inspired by perennials and roses dotting the Pelican greenhouse. The sculpture garden just around the corner from Lichtenstein’s massive strips of bacon (I know they’re Five Brushstrokes, don’t @ me) is free year-round. 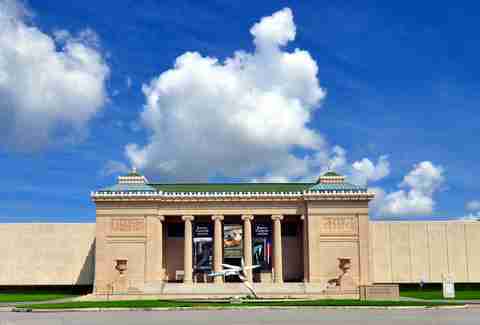 Every Wednesday, locals can enter the New Orleans Museum of Art for free as well. It’s the perfect way to get a bit more cultured without dropping a dime. Forgo the golf cart and myriad clubs and head to City Putt, the mini-golf course that boasts two 18-hole courses: one featuring Louisiana cultural markers and another celebrating New Orleans. Mr. Bingle, Louis Armstrong, and even miniature versions of works of art from the nearby sculpture garden make appearances. Morning Call has quite the New Orleans history, first setting up shop in the French Market over a century ago before moving to Metairie. 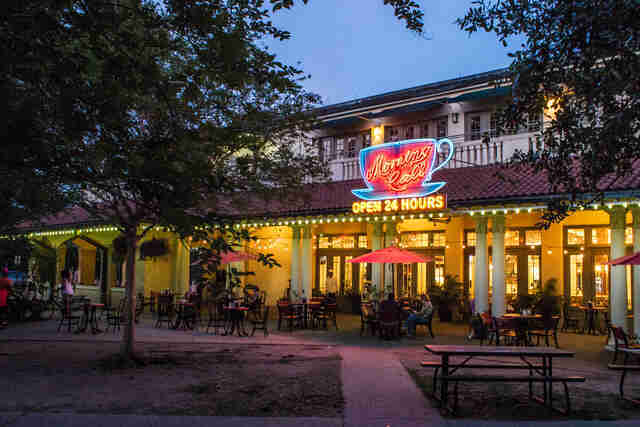 It opened up a new location at City Park’s Casino Building five years ago as a 24-hour eatery, serving up cafe au lait and beignets around the clock. It’s the perfect spot to hop over for a morning stroll or a late night at nearby Bud’s Broiler, a 24-hour bar. 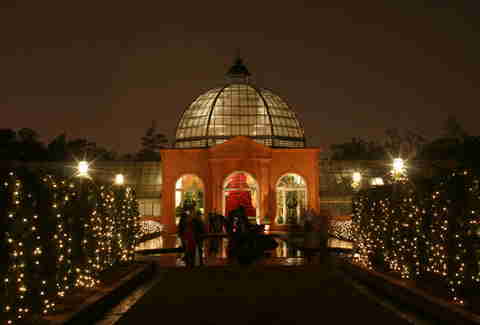 City Park lights up for the winter holiday season with Celebration in the Oaks, which runs from just after Thanksgiving to the new year. Standard Christmas lights wind their way through the park, along with a huge LED version of local holiday icon Mr. Bingle and more avant-garde scenes such a massive alligator and pirate ship. 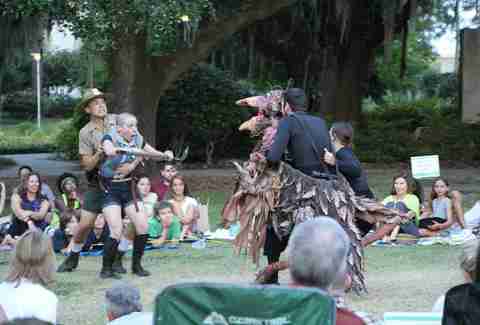 The NOLA Project regularly holds it down in the sculpture garden, culling from a wide variety of theatrical genres. This year saw a riveting run of The Three Musketeers and the world premiere of The Spider Queen from award-winning local director Jon Greene. 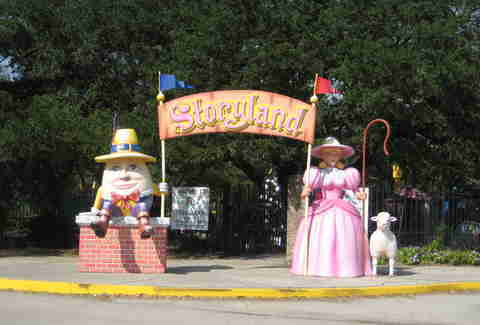 Not to be confused with Storyville, the nearby area known for its brothels, Storyland celebrates all things fairy tale. Most of the rides are kid-friendly, but why not hop aboard Captain Hook’s ship or the dragon roller coaster? It’s a fun spot to crash with friends, and no one can really pass up a spin around the carousel. That big stretch of water greeting you as you make your way from the streetcar to City Park has a pretty self-explanatory name: Big Lake. Yep, it’s the place you can leave dry land via kayak, paddleboat, and gondola. It’s also where you can find another picturesque tree known as “The Singing Oak,” resplendent with wind chimes that tinkle with the breeze. 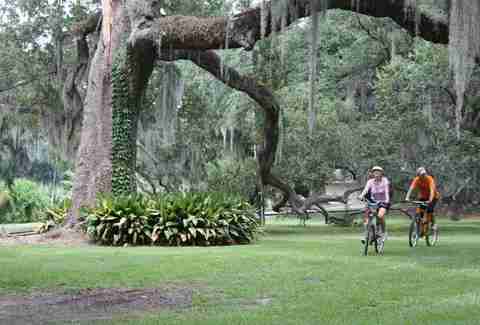 City Park is home to the sprawling Couturie Forest and, hidden away in its 60 acres, the highest point in New Orleans. At 43 feet, Laborde Lookout isn’t much of a mountain by any standards. Still, it’s a great place to picnic and become one with nature thanks to the cypress observation deck that was built in 2011. In viewing distance of the Peristyle sits a simple stone bridge built in 1902 that leads to Goldfish Island, aptly named the Goldfish Bridge. Both the bridge and the tiny patch of land with a park bench look like they’re straight out of a Rodrigue painting (minus the Blue Dog). It’s the perfect spot to sit down and relax with a book or let your thoughts wander as the clouds roll by. Don’t let anyone fool you into thinking Halloween is a one-day affair in New Orleans. 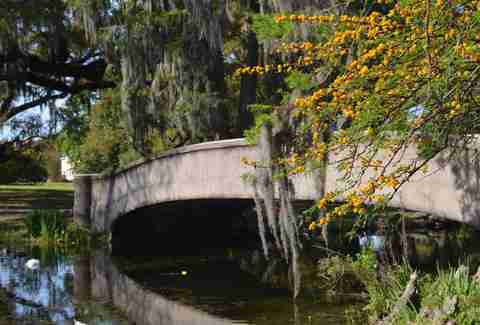 Halloween is one long weekend, whether you’re strolling Frenchmen or all the way up at City Park for Voodoo Fest. The annual music blowout features a smattering of EDM stars, rock bands, and rappers, many of whom get into the spirit by performing in costume. If anything, you’ll look more out of place in normal clothes than if you rocked a banana costume Friday through Sunday. City Park has two stadiums, a disk golf course, regular golf, fitness zones, and regular HIIT and zumba classes. 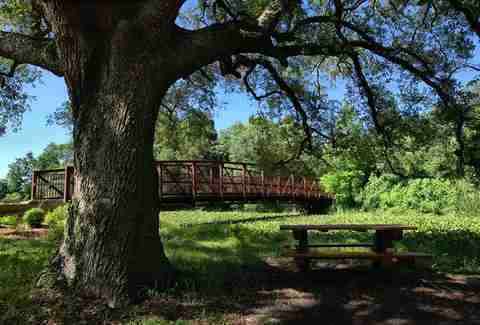 There’s no excuse not to get swole surrounded by ancient oaks and greenery, or just goof off with your pals for a bit (and maybe sweat off some of the many calories you’ve likely ingested the night before). You too can join the hapless throng of cyclists who settled on a tandem with side-by-side seats that barely know how to control the contraption. City Park is a great place to bike to and all around. For those without a set of wheels, the park offers bike rentals that range from the practical (cruisers) to the downright absurd (quad sports bike???). City Park’s Thursdays at Twilight music series has been going strong for years. 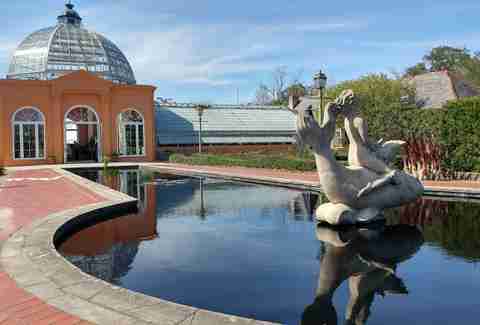 Every Thursday night in the Spring and Summer, musicians throw down at the Pavilion of Two Sisters in the Botanical Garden, playing the best in trad jazz, R&B, and even show tunes. 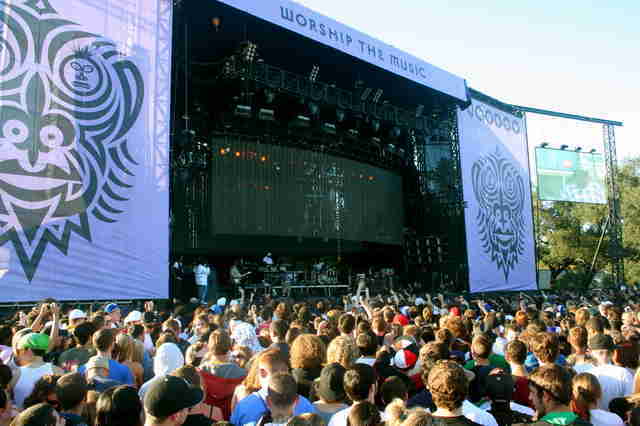 No performance would be complete without booze on the premises, and City Park offers a range of drinks for concertgoers to imbibe. If you can believe it, dueling was only outlawed in City Park in 1890. You may not be able to brandish your pistol at dawn but you can still check out the exact location where two men would enter, and sometimes only one man left. The Dueling Oaks are located on the corner of Dueling Oaks Drive and Dreyfous Drive, though there’s only one tree left, as the other was lost in a hurricane. For those looking for an even darker tree-lined spot, there’s always the Suicide Oak, which is said to be the spot where many came to hang themselves. It’s located on Victory Avenue, right by Marconi Drive. April Siese is a Thrillist contributor living in New Orleans. Give her a follow on Twitter @ayetalian.